Many years ago when I first got to know Red Knots and Horseshoe Crabs (a wonderful video I found on youtube), I have this dream that hoping one day I can see these two wonderful species on the coast. Red Knot is one of the most fascinating migratory sandpipers. They travel over 4,000 miles from south end of South America back to their breeding ground, arctic tundra and northern Canada each year. During spring migration, millions of Red Knots stopover at Delaware Bay and feed on the eggs of Horseshoe Crabs. If you have no idea what Horseshoe Crab is, I strongly suggest you to check out this remarkable creature that has existed on earth more than 300 million years ago. 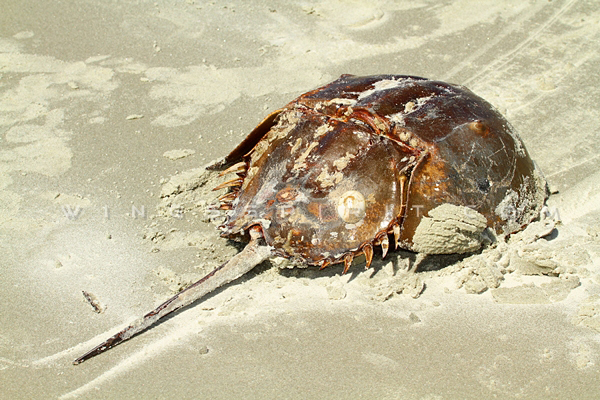 Each year, spawning Horseshoe Crabs will come to shore, mainly gather at Delaware Bay to lay eggs. Each female lays about 8,000 to 120,000 eggs and these eggs become an important food for Red Knots. I have not had a chance traveling to Delaware Bay. Actually, in order to protect Horseshoe Crabs from human's illegal harvesting, some part of Delaware Bay is closed in the month of May. So the only way for me to witness this spectacular event is to try my luck on my own coast. When I arrived at St. Simons Island, few residents told me most of Horseshoe Crabs came on shore in the end of April. 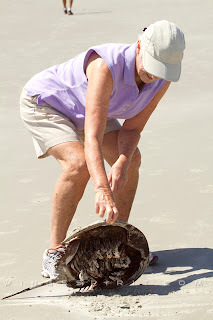 I still managed to photograph a Horseshoe Crab to share with everyone. Just for you to know that it will take about 10 to 12 years for a Horseshoe Crab to grow into a breeding adult and that will be only about the size of our palm not to mention their medical contribution to human health. Do you also know Horseshoe Crab has a "blue" blood instead of "red" like us and most of animals on earth? Its blood (contains copper) solidifies when encounters bacteria or endotoxins. Pharmaceutical companies and hospital use its blood extract to detect gram-negative bacteria in vaccine products or our blood stream.